An aweful warning for the New Year. 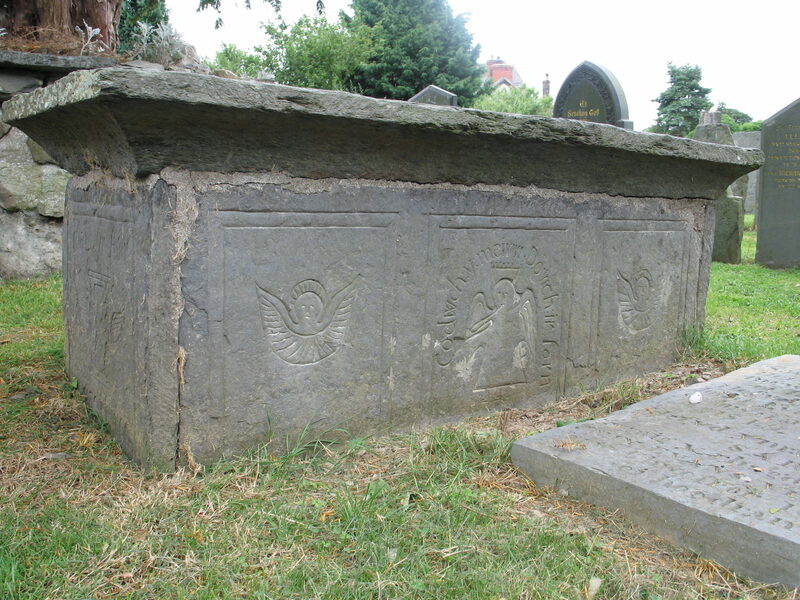 In the churchyard at Gwyddelwern in Denbighshire is this eighteenth-century chest tomb, commemorating the Rev. Edward Wynne (d. 1745) and his wife Jane (d. 1730). ‘Codwch y meirw, Dowch i’r farn’ – ‘Awake, dead, come to the judgement’. The Dreamer’s vision of the Day of Judgement in the beginning of Bunyan’s Pilgrim’s Progress includes ‘a voice saying, “Arise, ye dead, and come to judgement”; and with that the rocks rent, the graves opened, and the dead that were therein came forth’. 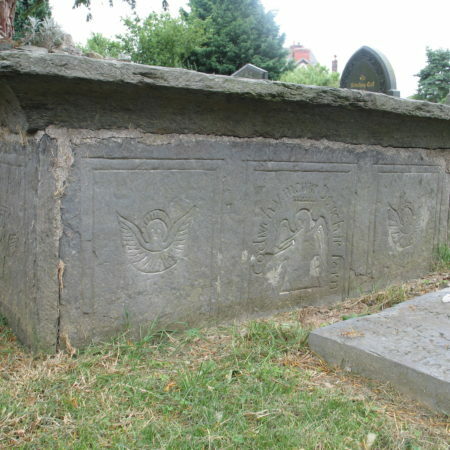 Probably as a result of this, the line appears on a number of eighteenth-century gravestones (there are examples at St Michael and All Angels, Elton, Notts. ; Dunstaffnage, Argyll; St Columba’s, Kingussie; and in in Old Errigal Cemetery, County Monaghan, and in Dromin and Monasterboice, Co. Louth). Our Twitter friend ‘Stiffleaf’ recorded it on a stone over the door to the nave at Broxbourne, Herts, and suggested that this could have been a reused tombstone. The Gwyddelwern example is the only version on a Welsh tomb that I know of, though Hywel Harris used a slightly different translation, ‘Cyfodwch feirw, a dewch i’r Farn’, on the weathervane of his great religious centre at Trefeca (Brecs). 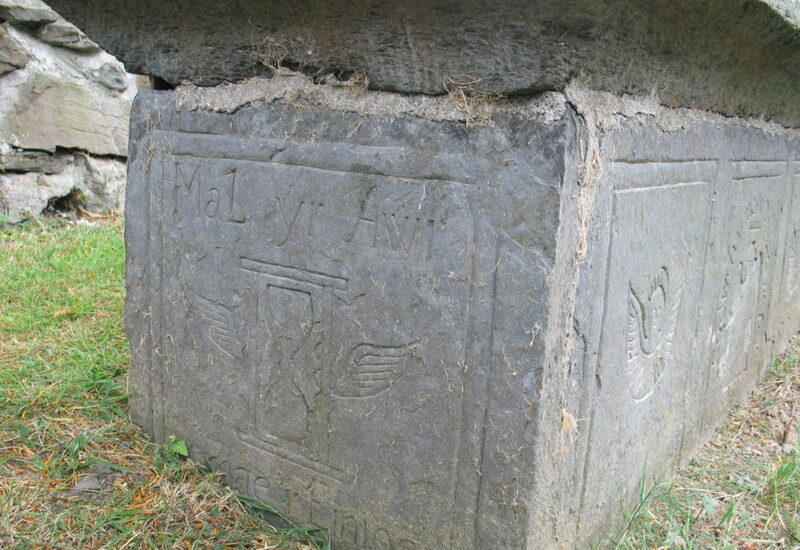 On the east end, around the winged hourglass, is another warning inscription in Welsh: ‘Mal yr awr, y mae’r Einioes’ – ‘Life is but an hour’ (thanks to David Hale and Gwen Awbery for help with the translation).